Objectives To assess the diagnostic accuracy and clinical utility of a simplified low cost method for measuring absolute and percentage CD4 counts with flow cytometry. Design A CD4 counting method (Blantyre count) using a CD4 and CD45 antibody combination with reduced blood and reagent volumes. Diagnostic accuracy was assessed by measuring agreement of the index test with two other assays (TruCount and FACSCount). Clinical utility was investigated by comparing CD4 counts with the new assay with WHO clinical staging in patients with HIV. Setting Research laboratories and antiretroviral therapy clinic at a medical school and large government hospital in southern Malawi. Participants Assay comparisons were performed on consecutive blood samples sent for CD4 counting from 129 patients with HIV. Comparison of CD4 count with staging was conducted on 253 consecutive new patients attending the antiretroviral therapy clinic. Main outcome measures Limits of agreement with 95% confidence intervals between index test and reference standards. Results The limits of agreement for Blantyre count and TruCount were excellent (cell count −48.9 to 27.0 cells/µl for absolute counts in the CD4 range <400 cells/µl and −2.42% to 2.37% for CD4 percentage). The assay was affordable with reagent costs per test of $0.44 (£0.22, €0.33) for both absolute count and CD4 percentage, and $0.11 for CD4 percentage alone. Of 193 patients with clinical stage I or II disease, who were ineligible for antiretroviral therapy by clinical staging criteria, 73 (38%) had CD4 counts <200 cells/µl. By contrast, 12 (20%) of 60 patients with stage III or IV disease had CD4 counts >350 cells/µl. Conclusions This simplified method of counting CD4 cells with flow cytometry has good agreement with established commercial assays, is affordable for routine clinical use in Africa, and could improve clinical decision making in patients with HIV. There are two main approaches for making CD4 counting more widely available in Africa: firstly, to reduce the cost of and simplify flow cytometric CD4 counting, and, secondly, to develop alternative counting methods. Flow cytometry, however, is the ideal method and has high accuracy.6 12 High throughput is possible as about 250 samples a day can be processed.8 Effective external quality assurance schemes are available in Africa with NEQAS (United Kingdom national external quality assessment scheme)13 and WHO CD4 REQAS/QASI (regional external quality assurance scheme/quality assessment and standardisation for immunological measures relevant to HIV/AIDS programme).14 Finally, flow cytometers can measure CD4 percentage as well as absolute counts. The main disadvantages are that flow cytometers are expensive and complex, reagent costs are high, and skilled laboratory staff are required. Over recent years several technological developments have shown that flow cytometric CD4 counting could be more straightforward. “Primary CD4 gating” uses just one antibody against CD4 and side scattered light to discriminate between lymphocytes and monocytes.20 21 Gating of lymphocytes by using CD45 expression and side scattered light is more accurate and reproducible than using light scatter characteristics alone.22 23 Recently, CD45 has been used to gate all leucocytes on dual platforms, using a flow cytometer for CD4 percentage and a haematological analyser for absolute leucocyte counts.24 This “panleucogating” strategy has been modified for single platforms (flow cytometer alone) but remains primarily focused on total leucocytes rather than on lymphocytes. We investigated whether these technologies could be miniaturised to reduce costs and applied them to the FACSCalibur flow cytometer. We developed a single platform method (the Blantyre count) that could be performed with reduced reagent costs and could accurately determine both absolute and percentage CD4 with increased simplicity compared with existing flow cytometric methods. 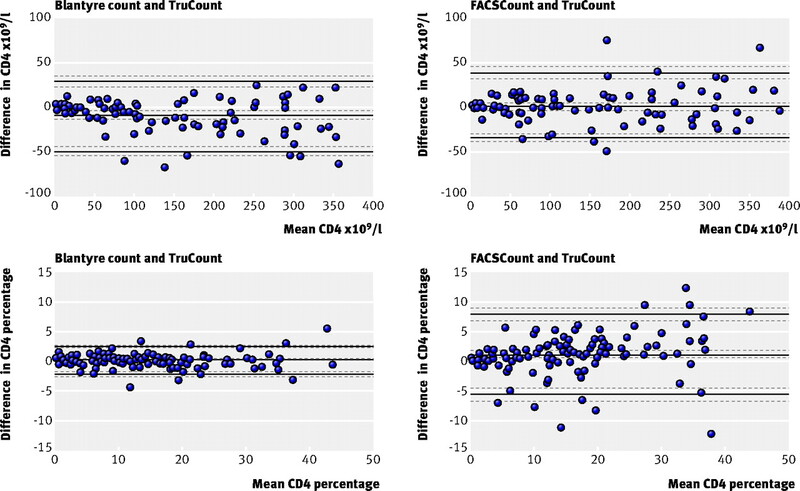 We compared our method with the existing TruCount and FACSCount CD4 counting assays for diagnostic accuracy and assessed the potential impact on clinical decision making. The study was conducted at the Malawi-Liverpool-Wellcome Trust Research Programme and Queen Elizabeth Central Hospital in Blantyre, the largest city in the southern region of Malawi. The estimated prevalence of HIV infection among adults in Blantyre district is 22%.25 All participants gave informed consent for CD4 counting. We used a FACSCalibur flow cytometer, a FACSCount instrument (both Becton Dickinson, CA, USA), and HmX haematological analyser (Beckman Coulter, CA, USA). We analysed flow cytometric data with CellQuest and MultiSet software. We used TruCount26 and FACSCount27 assays for CD4 counts using Multitest CD3/8/45/4 kits with TruCount tubes and FACSCount reagent kits (Becton Dickinson) according to the manufacturer's instructions. TruCount assays use four antibodies, a complex subgating strategy, and tubes containing pre-pipetted beads. We chose TruCount as the reference standard because it is a commercial CD4 counting method that was developed to be used on the same instrument as the index test (Becton Dickinson FACSCalibur flow cytometer) and generates both absolute and percentage CD4. We used FACSCount as a second reference standard because it is one of the most widely used CD4 counting technologies in Africa. Both TruCount and FACSCount generate CD4 counts on a single platform, although FACSCount requires a lymphocyte count from a haematological analyser to generate CD4 percentage. Both assays are used by clinical laboratories throughout the world and have been validated by consistently high performance in external quality assurance schemes such as UK NEQAS13 over a period of years. We used venous blood from healthy adults anticoagulated with EDTA to develop our assay. We used antihuman CD4 antibody conjugated with phycoerythrin (CD4-PE) and antihuman CD45 antibody conjugated with fluorescein isothiocyanate (CD45-FITC), FACS lysing solution (all Becton Dickinson), and CytoCount fluorescent microbeads (Dako, Denmark). Adjustable air-diplacement pipettes (Pipetman; Gilson, France) were used for all pipetting steps. The same pipette was used for reverse pipetting of blood and counting beads. CD4 T cell counts and total lymphocyte populations were determined by using staining for CD4 and CD45 with no attempt to gate total leucocytes or total T cells. We mixed 20 µl whole blood with 0.5 µl CD4-PE and 0.5 µl CD45-FITC antibodies and incubated samples for 15 minutes in the dark at room temperature. Red cells were lysed with 180 µl of 1× FACS lysing solution and incubated for a further 10 minutes. We added 10 µl of CytoCount beads by reverse pipetting before we ran samples through the cytometer. We used reverse pipetting for pipetting blood and counting beads as precise volumes are critical and this method is more accurate than conventional pipetting.12 Pipette calibration and pipetting accuracy were assessed by dispensing 10 µl and 20 µl aliquots of water on to a scientific balance. Bead events, 2000 per sample over about 60 seconds, were acquired by using a live gate with acquisition threshold set on the FL1 (FITC) channel. 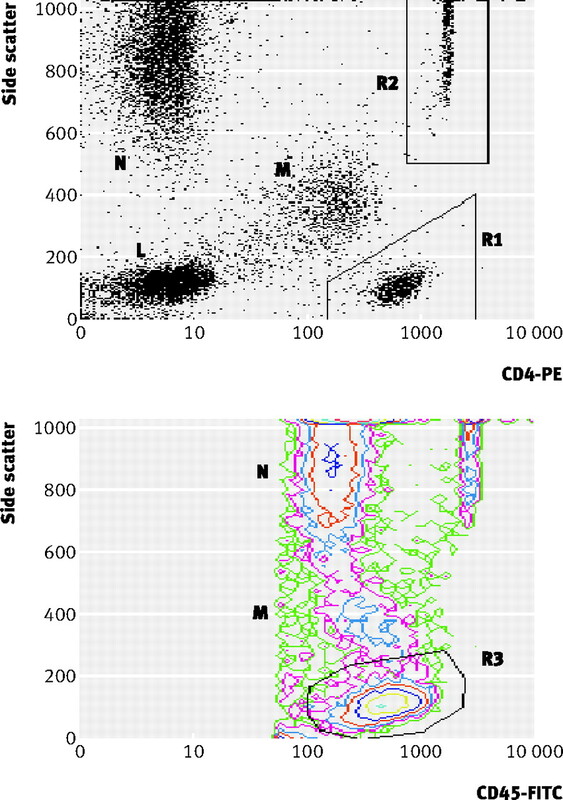 Analysis was performed with a CD4-PE against side scatter dot plot with manual gating of the CD4 T cell population (R1) and counting beads (R2) (fig 1 top)⇓ and a separate side scatter against CD45-FITC contour plot for manual gating of the total lymphocyte population (R3) (fig 1 bottom). We calculated absolute CD4 counts (cells/µl) with the formula: (CD4 T cell events (R1)/bead events (R2))×([bead solution] (beads/µl)/2). We calculated CD4 percentage with the formula: (CD4 T cell events (R1)/lymphocyte events (R3))×100. We assessed repeatability of our assay by performing five repeats of the assay on four blood samples and examined stability of results with time by leaving a blood sample in the laboratory at room temperature and performing five repeats of the assay daily on the sample over five days. We modified our assay to reduce costs further when only an absolute or percentage CD4 is required. The absolute CD4 count alone variant used CD4-PE antibody plus beads but without CD45-FITC antibody (Blantyre count (absolute)). The variant giving the CD4 percentage alone used CD4 and CD45 antibodies without counting beads (Blantyre count (percentage)). In the main CD4 counting comparison study we included consecutive blood samples from patients with HIV sent to our laboratory for full blood count and CD4 count determination from 27 January to 17 February and from 18 April to 9 May 2006 (n=134). We measured CD4 and CD4 percentage for each sample using Blantyre count, Blantyre count (absolute), TruCount, and FACSCount assays. We carried out a subsequent smaller study on consecutive blood samples from patients with HIV sent to the laboratory in June 2006 to compare CD4 percentages generated by Blantyre count and Blantyre count (percentage) assays (n=28). Samples were not used if they exhibited clots, were sent from outside Queen Elizabeth Central Hospital, or were received after the day of blood collection or if insufficient blood was available to complete all tests. There were no other selection criteria. Blood samples were analysed on the day that they were taken unless they were received after 4 pm in which case they were processed the next morning. Data collection was planned before the index tests and reference standards were performed. All blood samples from all participants meeting the inclusion criteria underwent the index and reference standard tests. No adverse events occurred from performing these tests. Two authors (FS and JB) performed and read the FACSCount assay and full blood count. Two other authors (MKPL and CAM), both of whom had previous experience of flow cytometry, performed and read TruCount and Blantyre count assays together within six hours of the FACSCount assay. We have subsequently trained local laboratory technicians over two to three days to perform the Blantyre count method. Manual gating of events acquired with Blantyre count was performed blind to other results. As the FACSCount does not give CD4 percentages, we calculated this from the FACSCount absolute CD4 count and total lymphocyte count from the haematological analyser using the formula (CD4 (cells/µl)/total lymphocyte count (cells/µl))×100. This procedure is prone to error because CD4 percentage is generated on a dual platform setting, which is inherently more variable than single platform operations. For absolute CD4 counts, we assessed agreement only for samples with a TruCount CD4 count below 400 cells/µl as this is the relevant range for clinical decision making. For comparisons of CD4 percentage we used all samples. We tested a further 253 EDTA anticoagulated venous blood samples from new patients attending the adult antiretroviral therapy clinic from May to July and from September to October 2006 for CD4 count using Blantyre count. CD4 counts and clinical staging were compared for each patient. Clinical staff in the antiretroviral therapy clinic performed staging blind to CD4 count results. To determine the accuracy of Blantyre count, we enrolled the assay for external quality assurance with the NEQAS immune monitoring scheme.13 CD4 results were determined on six NEQAS stabilised blood samples from the UK between January and May 2006. We examined agreement between each pair of methods using Stata 9 by estimating bias and limits of agreement (=bias plus or minus 1.96×SD) with 95% confidence intervals as described by Bland and Altman.28 Repeatability was assessed with coefficients of variation obtained from five repeats of assays. With 20, 10, 5, 2, and 1 µl of control blood per Blantyre count assay, coefficients of variation were 4.2%, 4.2%, 6.1%, 8.1%, and 10.7%, respectively, showing a progressive increase in coefficients of variation below 10 µl of blood. There was a decrease in mean absolute CD4 count as blood volume was reduced (712, 681, 645, 539, and 448 cells/µl, respectively). CD4 percentages showed better overall repeatability (coefficients of variation 2.8% with 20 µl blood) and the coefficient of variation did not noticeably increase until blood volume was reduced to 2 µl (4.8%). We used 20 µl blood for our assay as twice the lowest volume at which optimal assay repeatability was maintained. We used a similar process to determine optimal counting bead volume. With 10 µl counting beads the coefficient of variation was 4.2%, and similarly with 5 µl beads (4.3%), but increased to 8.9% and 5.7% with 2 and 1 µl beads, respectively. Mean CD4 counts were not affected by bead volume. We used 10 µl counting beads for our assay. Finally, we titrated down the quantities of antibody per assay. Discrimination of CD4 T cell and total lymphocytes as discrete populations was still possible down to 0.25 µl of CD4-PE and 0.25 µl CD45-FITC. We chose 0.5 µl of each antibody for use in our assay. Using these quantities, the costs of reagents per assay were $0.44 (£0.22, €0.33) for both absolute and percentage counts, $0.40 for an absolute CD4 count, and $0.11 for CD4 percentage alone (table 1)⇓. In agreement studies we tested blood samples from 130 patients with HIV. One sample gave an absolute CD4 count >2000 cells/µl with FACSCount and was excluded from subsequent analyses. There were no indeterminate or missing results. The median age of patients was 33 years (range 2-75 years); 79 were females; and 38 (29%) were taking antiretroviral therapy at the time of testing. Of the 253 new patients for whom CD4 count was compared with clinical staging in the antiretroviral therapy clinic, the median age was 33 (range 14-71), and 173 were female. None was taking antiretroviral therapy. We used a subset of 28 of these patients for the separate comparison of Blantyre count with the Blantyre count (percentage) variant. The median age in this subset was 35 years (range 24-64 years), and 18 were female. We calculated coefficients of variation on five repeats of our assay on four blood samples with mean CD4 values 718, 712, 260, and 191 cells/µl and mean CD4 percentage 40.3%, 42.9%, 15.0%, and 13.8%. Mean (SD) coefficients of variation were 5.2% (2.7%) for absolute CD4 count and 2.5% (0.8%) for CD4 percentage. In tests on six stabilised blood samples (CD4 count 117-1269 cells/µl and percentage 7.28%-60.73%) from NEQAS with our assay, five of six absolute CD4 counts and five of six CD4 percentages were within 1 SD of the NEQAS value, with one result of six between 1 and 2 SD of this value for each test. Blantyre count values were on average 95% of the absolute NEQAS CD4 count and 97% of the CD4 percentage. CD4 T cell and lymphocyte populations could be clearly distinguished and gated over the five days of the stability study, with a blood sample with day 1 CD4 count of 487 cells/µl and CD4 percentage of 36.1%. Daily coefficients of variation for absolute counts remained below 6% and for CD4 percentage below 2.5%. The mean absolute CD4 count stayed within 10% and the CD4 percentage within 5% of the day 1 values. Of the new patients attending the antiretroviral therapy clinic, 76% (193/253) were clinical stage I (n=77) or stage II (n=116), while 24% (60/253) had stage III (n=51) or stage IV (n=9) HIV/AIDS. The range of CD4 counts in each group was wide with a progressive fall in median CD4 counts from stage I (286 cells/µl) to stage IV groups (110 cells/µl). Twenty five (32%) patients with stage I disease and 48 (42%) with stage II disease had a CD4 count <200 cells/µl. Eleven (22%) patients with stage III and one (11%) patient with stage IV HIV/AIDS had a CD4 count >350 cells/µl (table 3)⇓. Within Malawi, we have developed an affordable accurate method of counting CD4 cells with flow cytometry by refining and miniaturising existing technology. Increasing affordability by reducing reagent costs is a critical step in making this available in countries with limited resources. Currently the reagent cost of a comparable commercially available flow cytometric assay in Africa is $5.04 (£2.52, €3.74). As we were able to reduce costs of reagents to $0.44 (£0.22, €0.33) per assay, there is the potential for 91% cost savings. This would increase to 98% if only CD4 percentage is required but would decrease if the costs of competing tests are reduced. Cost reduction was not achieved at the expense of accuracy. Over the CD4 count range of 0-400 cells/µl, our assay showed minimal bias and excellent agreement compared with established CD4 counting methods (TruCount and FACSCount). Determination of CD4 percentage by Blantyre count and TruCount methods showed excellent agreement over the full range of CD4 percentages. The good performance of Blantyre count in the NEQAS immunophenotyping scheme further shows the accuracy of this method. Our study validates the use of a simplified, affordable, and accurate method of CD4 counting with flow cytometry. Unlike many previous studies of affordable flow cytometry,20 21 22 24 we carried out this work in a country where affordability is of chief importance. We looked at both absolute and percentage CD4, which have previously been neglected. The limits of agreement are similar to those of previous comparison studies of flow cytometry and narrower than studies using other methods,15 16 17 18 which are inherently less accurate. By miniaturising the present assay, we managed to reduce reagent costs further compared with previous studies. Even with the simplifications introduced, however, CD4 counting with flow cytometry requires a level of technical skill not always present in resource poor settings,9 a reliable power supply, and a cold chain for reagent supplies. A flow cytometer represents a large capital outlay, which is not always feasible, although donor funding is sometimes available to help provide such instruments. The excellent agreement between Blantyre count and TruCount assays indicates that use of CD3 antibody by TruCount is redundant in CD4 counting with flow cytometry. This means that Blantyre count technology could be operated on less complex instruments than the FACSCalibur, deploying only one laser and three photomultiplier tubes to detect side scattered light and fluorescence emitted from FITC and PE fluorochromes. Such an instrument could be manufactured at lower cost compared with the FACSCalibur and would be simpler and less expensive to maintain. Even on five day old blood, our gating strategy enabled both CD4 T cells and lymphocytes to be easily discriminated from monocytes, thereby maintaining good repeatability with little variability from day one counts. Blantyre count could make the greatest impact on the care of children under 5 with HIV. Appropriate determination of CD4 percentage has often been neglected by investigators seeking to produce affordable CD4 counting.6 8 Determination of CD4 percentage alone by the Blantyre count (percentage) variant is not only much cheaper than determining absolute CD4 counts but also technically easier, as accurate volumetric pipetting and counting beads are not required. CD4 percentages were also more stable than absolute counts over five days in the same sample. The determination of CD4 counts with Blantyre count in the antiretroviral therapy clinic confirms that use of WHO clinical staging criteria alone for deciding who should start antiretroviral therapy is suboptimal. About a third of patients with clinical stage I or II disease who would not be eligible for antiretroviral therapy on clinical grounds were severely immunosuppressed with a CD4 count of <200 cells/µl. Conversely, two fifths of patients with stage III and IV disease who were eligible to start antiretroviral therapy had CD4 counts >200 cells/µl and a fifth had counts >350 cells/µl. Clinical staging alone is missing many patients who urgently need to start antiretroviral therapy, while some stage III and IV patients are started on antiretroviral therapy when treatment could possibly be postponed. Consideration of the economic feasibility of using the Blantyre count in Malawi has to include the capital cost of the flow cytometer (about $100 000), the annual service contract (about $10 000), and the salary of a laboratory technician (typical monthly salary $500) as well as reagent prices. The contribution of these non-reagent costs to the total cost per assay is inversely proportional to assay throughput. With the cost of such an instrument spread over 10 years, CD4 counting with flow cytometry would not be viable if only 200 samples were run on an instrument each month, as “non-reagent costs” per sample would be $10.83. If, however, 200 samples are run on a flow cytometer each day, which is well within the capacity of the instrument (over 250 days this would be 50 000 samples a year), non-reagent costs are $0.52 per sample, giving a total assay cost of $0.96. Therefore, use of the Blantyre count method would be most cost effective with a limited number of flow cytometers operating at high sample throughput in regional centres and a coordinated system for transporting samples to these centres from peripheral clinics. We have described an affordable accurate method of CD4 counting that has the potential to improve clinical decision making in the treatment of patients with HIV and service the whole of a country the size of Malawi using a limited number of instruments in regional centres. This arrangement could be facilitated by the use of blood stabilising agents such as Transfix, permitting delays in sending samples to regional centres.29 It remains to be seen whether such a service could be successfully implemented in such a resource poor setting. This is version 3 of the paper. In version 1 and 2 the unit for CD4 cell count was incorrectly given as ×109/l. This has now been corrected to read cells/µl. We thank Emily Lifa for blood sampling in the antiretroviral therapy clinic at Queen Elizabeth Central Hospital and all staff at the antiretroviral therapy clinic for their assistance with this study. Contributors: CAMacL was responsible for the study conception, coordinated the study, drafted the initial manuscript, and is guarantor. CAMacL, MKPL, MEM, MTD, JJGvO, MJM, and EEZ contributed to the study design. MKPL and CAMacL optimised the Blantyre count method. CAMacL, MKPL, FS, and JB did flow cytometric assays. CAMacL, SAW, and MKPL analysed the data. All authors contributed to the writing of the manuscript and approved the final version. Funding: CAMacL holds a training fellowship in clinical tropical medicine from the Wellcome Trust (No 067902/Z/02/Z). MKPL received a travel award from the British Society for Immunology. MEM holds a programme grant from the Wellcome Trust (No 074124/Z/04/Z). Ethical approval: College of Medicine research and ethics committee. Peer review and provenance: Non-commissioned, externally peer reviewed. Ministry of Health. HIV Unit, ART quarterly report for March 2007. Lilongwe, Malawi: Ministry of Health, 2007. Kassa E, Rinke de Wit TF, Hailu E, Girma M, Messele T, Mariam HG, et al. Evaluation of the World Health Organization staging system for HIV infection and disease in Ethiopia: association between clinical stages and laboratory markers. AIDS 1999;13:381-9. Zachariah R, Teck R, Ascurra O, Humblet P, Harries AD. Targeting CD4 testing to a clinical subgroup of patients could limit unnecessary CD4 measurements, premature antiretroviral treatment and costs in Thyolo District, Malawi. Trans R Soc Trop Med Hyg 2006;100:24-31. Harries AD, Schouten EJ, Libamba E. Scaling up antiretroviral treatment in resource-poor settings. Lancet 2006;367:1870-2. Comans-Bitter WM, de Groot R, van den Beemd R, Neijens HJ, Hop WC, Groeneveld K, et al. Immunophenotyping of blood lymphocytes in childhood. Reference values for lymphocyte subpopulations. J Paediatr 1997;130:388-93. Brando B, Barnett D, Janossy G, Mandy F, Autran B, Rothe G, et al. Cytofluorometric methods for assessing absolute numbers of cell subsets in blood. European Working Group on Clinical Cell Analysis. Cytometry 2000;42:327-46. Whitby L, Granger V, Storie I, Goodfellow K, Sawle A, Reilly JT, et al. Quality control of CD4+ T-lymphocyte enumeration: results from the last 9 years of the United Kingdom national external quality assessment scheme for immune monitoring (1993-2001). Cytometry 2002;50:102-10. Mandy F, Bergeron M, Houle G, Bradley J, Fahey J. Impact of the international program for quality assessment and standardization for immunological measures relevant to HIV/AIDS: QASI. Cytometry 2002;50:111-6. Loua A, Kestens L, Vanham G, Boel L, Colebunders R, Gigase P, et al. Validity of an ELISA test for CD4+ T lymphocyte count and validity of total lymphocyte count in the assessment of immunodeficiency status in HIV infection. Ann Soc Belg Med Trop 1994;74:61-8. Mwaba P, Cassol S, Pilon R, Chintu C, Janes M, Nunn A, et al. Use of dried whole blood spots to measure CD4+ lymphocyte counts in HIV-1-infected patients. Lancet 2003;362:1459-60. Nouanthong P, Pata S, Sirisanthana T, Kasinrerk W. A simple manual rosetting method for absolute CD4+ lymphocyte counting in resource-limited countries. Clin Vaccine Immunol 2006;13:598-601. Diagbouga S, Chazallon C, Kazatchkine MD, Van de Perre P, Inwoley A, M'Boup S, et al. Successful implementation of a low-cost method for enumerating CD4+ T lymphocytes in resource-limited settings: the ANRS 12-26 study. AIDS 2003;17:2201-8. Janossy G. Dried blood spot technology for CD4+ T-cell counting. Lancet 2004;363:1074. Sherman GG, Galpin JS, Patel JM, Mendelow BV, Glencross DK. CD4+ T cell enumeration in HIV infection with limited resources. J Immunol Methods 1999;222:209-17. Janossy G, Jani I, Göhde W. Affordable CD4+ T-cell counts on ‘single-platform' flow cytometers I. Primary CD4 gating. Br J Haematol 2000;111:1198-208. Gelman R, Wilkening C. Analyses of quality assessment studies using CD45 for gating lymphocytes for CD3+CD4+%. Cytometry 2000;42:1-4. Schnizlein-Bick CT, Mandy FF, O'Gorman MRG, Paxton H, Nicholson JKA, Hultin LE, et al. Use of CD45 gating in three and four-color flow cytometric immunophenotyping: guideline from the National Institute of Allergy and Infectious Diseases, Division of AIDS. Cytometry 2002;50:46-52. Glencross D, Scott LE, Jani IV, Barnett D, Janossy G. CD45-assisted PanLeucogating for accurate, cost-effective dual-platform CD4+ T-cell enumeration. Cytometry 2002;50:69-77. National Statistical Office (NSO) [Malawi], and ORC Macro. Malawi demographic and health survey 2004. HIV/AIDS prevalence. Calverton, Maryland: NSO and ORC Macro, 2005. Schnizlein-Bick CT, Spritzler J, Wilkening CL, Nicholson JKA, O'Gorman MRG. Evaluation of TruCount Absolute-Count tubes for determining CD4 and CD4 numbers in human immunodeficiency virus-positive adults. Clin Diagn Lab Immunol 2000;7:336-43. Lopez A, Caragol I, Candeias J, Villamor N, Echaniz P, Ortuño F, et al. Enumeration of CD4+ T-cells in the peripheral blood of HIV-infected patients: an interlaboratory study of the FACSCount system. Cytometry 1999;38:231-7. Bland JM, Altman DG. Statistical methods for assessing agreement between two methods of clinical measurement. Lancet 1986;i:307-31. Jani IV, Janossy G, Iqbal A, Mhalu FS, Lyamuya EF, Biberfeld G, et al. Affordable CD4+ T cell counts by flow cytometry II. The use of fixed whole blood in resource-poor settings. J Immunol Methods 2001;257:145-54.